The KSC75 Titaniums soft, foam ear cushions guarantee an open, hear-through sound for when you prefer to stay connected to your surroundings. Pivoting clips provide a better fit than most over-the-ear sports headphones. 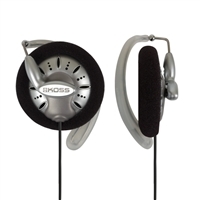 Featuring a 2 mm titanium coating on its diaphragms, Koss KSC75s boast increased rigidity, minimized mechanical distortion, and exceedingly accurate sound quality and reproduction. Perfect for travel, the KSC75s deliver outstanding sound at home or on the move.